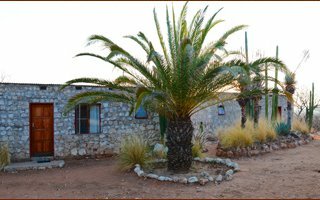 Bambatsi Guest Farm is one of the oldest farms in Namibia and is situated between Outjo and Khorixas. It features a swimming pool, bar, restaurant and spectacular views over the landscape. 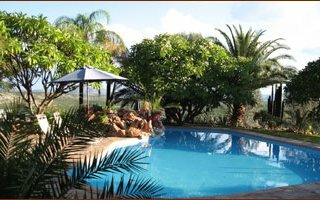 Guests can relax by the pool and at night do some stargazing while listening to the sounds of nocturnal nature around. 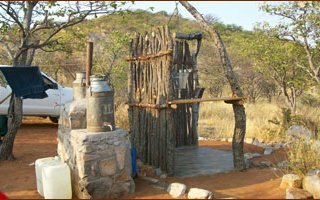 The farm house is built on a plateau that overlooks the beautiful mopane landscapes. 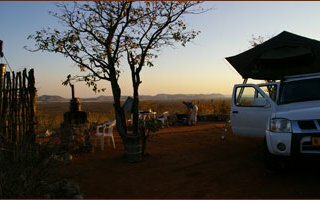 Our accommodation offers eight bungalows and two campsites. 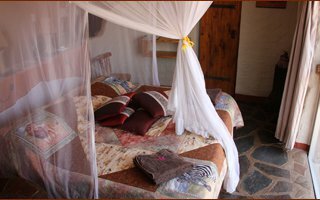 Each bungalow is comfortably furnished with en-suite bathroom and private patio; while our campsites are on top of a hill – closer to nature. Guests can enjoy a delicious breakfast early in the morning and dinner in the dining area. 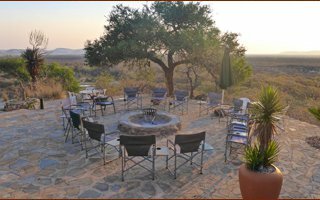 Guests can sit and enjoy a drink at the bar while watching game at the waterhole and experiencing the true African sunsets. 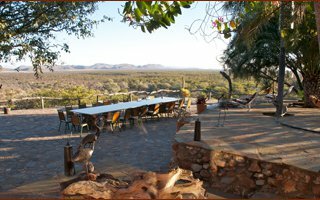 We offer day trips to the Vingerklip, Twyfelfontein and Petrified Forest. 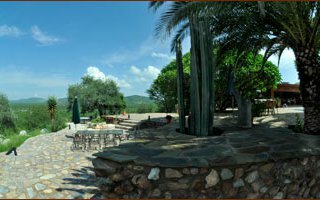 Guests can also take walks through the surrounding mountains or the mopane forest and catch sight of our indigenous animals and birds. 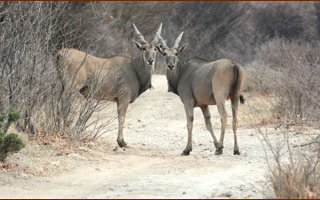 Close-by is the Etosha National Park, with over 114 mammal species, 340 bird species, 16 reptile and amphibians as well as lots of insects protected by the Park. 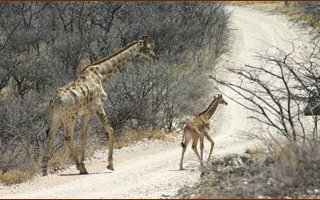 Guests will be able to see elephants, Burchell’s Zebra, springbok, giraffe, red hartebeest, blue wildebeest, eland, kudu, roan, gemsbok, jackal, hyena, lion, ostrich and sometimes cheetah and leopard. There is also the Petrified Forest, scattered with petrified tree trunks of up to 34m long and 6m around which are more or less older than 260 million years. We also have the extensive galleried rock art in Twyfelfontein. It was named by a European settler D. Levin. The unusual vingerklip lies on the Bertram farm and is quite popular for its extreme features. Is it like a tower-like-pillar, about 35m high and formed for over 15 million years ago.